Since 2008 PlaySys is involved in the wide range of editorial and publishing projects covering the subjects of technology, architecture, and design. The company took part in bringing to the Italian market of international publications like 3D World Magazine and Seven Magazine working on the localization of the editorial content. PlaySys was a partner of another famous brand Fotografia Facile providing localization services and creation of original editorial content connected to the texts and images. At PlaySys we believe in delivering high-quality content required by our readers. 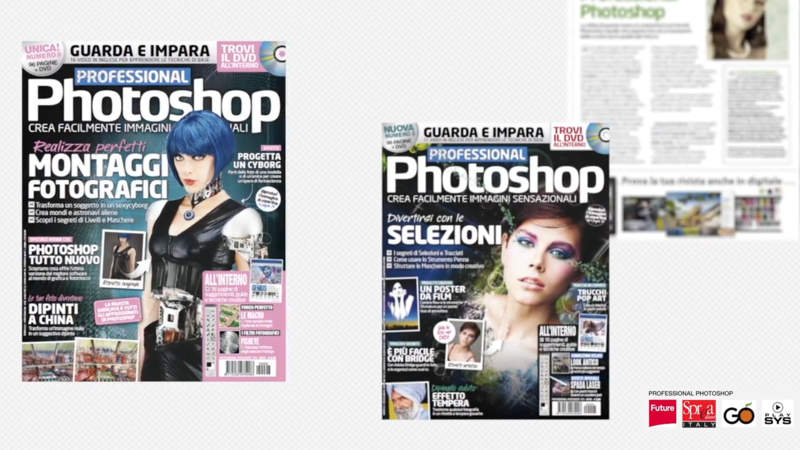 In the ongoing cooperation of PlaySys with Gruppo Orange, Sprea and Future Plc makes it possible to deliver Italian-localized video tutorials on the subjects of photography and post-production for the monthly printed editions of Professional Photoshop and Digital Camera World. During 2011-2012 PlaySys has put on the market six issues of My Muse Mag, the artistically printed edition for dolls’ collectors, providing exclusive visual and story content. The publication is still available online through download. The success of 3ds Max Architettura e Design manual written by PlaySys owner and founder Luca Deriu and published by Hoepli in 2009 led to the second edition of this book in 2012 (also published by Hoepli) and to V-Ray e Progettazione 3D, written by Luca Deriu in 2013 and published by EPC Editore. The company had built its reputation in the world of computer graphics and in 2012 launched its own multi-language non-periodical publication, 3D Architettura, with the goal to create an international online community for arch-viz professionals. 3D Architettura. Digital Architecture Magazine is an international non-periodical publication about 3d, CG, architecture and design started in 2012. During the last years 3D Architettura has become an international community that unites 3D visualization artists, architects and designers. The publication shares interesting stories of success, inspiring renders and practical information about everything connected to architectural visualizations, both offline and real-time. Digital Camera World is the prestigious publishing of Future Publishing PLC very famous also for TechRadar, LifeHacker, PCGamer, GamesRadar, Kotaku, EDGE, Metal Hammer, 3D Artist and many other high-level publications. our contribute on Digital Camera Magazine is related to the conversion for the italian market where the magazine is published by Spera Editori SpA under the name of Digital Camera Magazine. PlaySys focus is on the quality and content of the video tutorial on Photoshop, Camera RAW and Lightroom softwares for photography post production. Since before PlaySys was founded, Luca Deriu, is involved in education programmes within many universities.A sign of this passion for spreading the knowledge about our wonderful topics on innovation, 3D computer graphics and programming, is written on paper, printed and distributed by Hoepli, one of the most prestigeus italian publishers. Before the sad decision of our publisher, Sprea Editori SpA, to shut down this amazing magazine in 2010, we fully managed the translation for the italian market. Every month we were receiving the original contents from the UK source and we were checking the quality for then translating and redesigning the layout, since written italian language is somewhat 30% longer. Sad the magazine is no longer available since it got substituted by the also brilliant 3D Artist. EPC Editore from Rome believes in our knowledge and approach and hired us to write a technical manual on the usage of V-Ray, the famous renderer developed by Chaos Group. In the book, beside the explaination of the functionalities, we added our very personal tips-and-tricks which made PlaySys 3D projects so demanded in the latest years. Pamela De Lorenzi played a deep role in the fouding of PlaySys agency. Her technical role as layout designer for several magazines (such as 3D World, professional Photoshop, Seven Magazine and Fotografia Facile) and manuals (both our pubblications for Hoepli) united with her work for Barbie Magazine for Mattel gave birth to My Muse Mag, a magazine entirely dedicated to doll collectors. Pamela entirely developed the five issues of this beautifully done magazine, published and distributed by PlaySys on paper and digital publication. This masterpiece is still very demanded by collectors and gained an enormous value in its market field.